Marina del Rey boat owners oppose plan to strip polluting paint from hulls and fear they'll have to pay for removing copper from water. Plans for the first extensive pollution cleanup in Marina del Rey history have sparked a revolt by boat owners at the tony harbor that could echo along the length of the California coast. 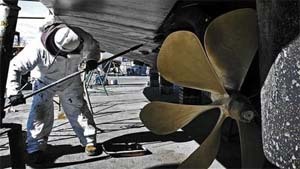 The Los Angeles Regional Water Quality Control Board on Thursday will consider rules that would force boaters to strip copper paint from the bottoms of their boats and replace it with a less toxic alternative. To clean copper already in the water, the plan also calls for the county to spend at least $147 million dredging the nearly 50-year-old marina, the nation's largest manmade recreational boating harbor. 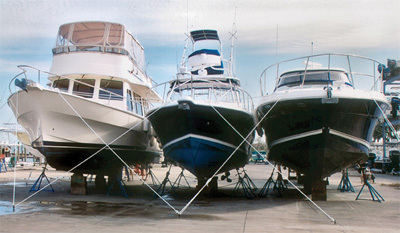 Almost all of the marina's more than 4,500 boats have bottoms covered in copper paint. Boatbuilder David Stimson is about ready to move to Belfast, four months after Boothbay officials shut down his boat shop for violating the local zoning ordinance. 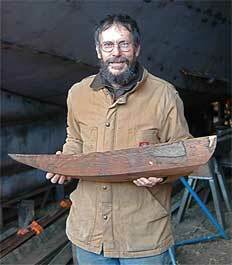 He's been building boats for more than 30 years. Stimson and his wife, Tamora Goltz, are considering leaving the Burnham Cove home they built years ago for themselves and their two sons, who work with their father in the business. Boothbay's code enforcement officer, acting on complaints from a couple of neighbors, informed Stimson he can't build boats in a residential district, although he has been building and repairing vessels of varying sizes on his property since 1981. He has already built a new boat shop, with a permit from the town, but is not being allowed to complete the 50-foot steel staysail schooner under construction within the shop. At issue is whether boatbuilding is a permitted use. Stimson says yes, town officials say no. If Stimson Marine resumes work on the vessel, the company risks a $10,000 daily fine from the town. This exciting, annual show attracts over 20,000 visitors from throughout New England, all looking to purchase everything from popular brand name power boats and small size sailboats to electronic navigational systems and fishing gear. 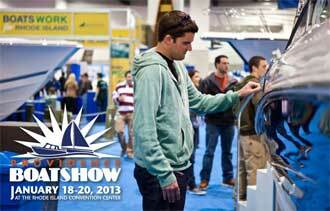 The Annual Providence Boat Show is one of the finest boat shows to take place during the winter season. Students who complete the International Yacht Restoration School (IYRS) programs will be granted up to 30 credits toward bachelor's or associate degrees offered by Roger Williams University (RWU) School of Continuing Studies. As part of a strategy to offer students a direct pathway from experiential training programs focused on craftsmanship and technical skills to a comprehensive college education that results in an associate or bachelor's degree, Roger Williams University and marine trades and technology school IYRS have joined forces on a partnership that will allow IYRS graduates to apply elective credits toward degree programs offered at the University's School of Continuing Studies. "Many of our younger students, passionate about working with their hands and building things, also want a two- or four-year degree that enriches their lives and offers broad opportunities," says IYRS President, Terry Nathan. "Partnering with Roger Williams achieves this goal. RWU is a great school with a beautiful campus. Importantly, we share common values and educational principles." PROVIDENCE, R.I. -- July 11, 2012 - Owners of Rhode Island's 40,500 registered boats will pay more in fees beginning next year to create a fund to remove abandoned vessels and other obstructions to navigation. About $100,000 per year would be raised by adding a fee to the state's biennial boat registration. The fee would be based on the size of the boat, from $2 for a small boat to $20 for a boat larger than 51 feet. The money would be disbursed by a five-member commission that would consist of representatives of the marine trades, environmental groups, municipal harbormasters, and the state. Environmental and boating officials estimate there are between 30 and 40 abandoned boats left in Rhode Island's public waters each year. Bristol, RI, June 2012��The Picton Castle, a three-masted tall ship based in Lunenburg, Nova Scotia, Canada is currently docked in Bristol Harbor through July 4, 2012. Bristol�s Town Dock Master, Joe Cabral, is hosting the ship and its crew on the west side of the Church Street dock for their entire 11 day stay. 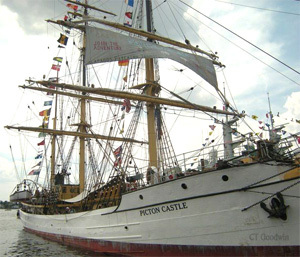 The Picton Castle, with Captain Daniel Moreland at the helm, arrived in Bristol from Baltimore, MD, with 25-30 crew before it carries on to Newport for the Ocean State Tall Ship�s Festival. While in Bristol, a variety of events are planned to take place aboard ship including a July 2nd marine industry event for 100 guests co-hosted by the Bristol Harbor Master and the Rhode Island Marine Trades Association. Anyone interested in becoming a member of RIMTA is invited to attend this special event. Please contact Wendy at 401-396-9619 to receive your personal invitation to this party. IT COMES AS A BIT OF A SHOCK to learn that the first yacht to have been sailed all the way around the world singlehanded was actually not very seaworthy. Apparently Capt. 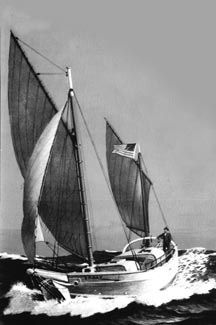 Joshua Slocum�s famous Spray, which has been copied lord knows how many times, was unlikely to right herself after a capsize. She was extremely stiff initially, but once heeled beyond a certain angle was unlikely to recover. This assessment, which is not the best news for the many owners of existing Spray clones, came from one of America�s best-known sailboat architects, John G. Hanna, designer of the famous Tahiti ketch. "In all probability the bill would have resulted in a ban on the use of copper-based hull paints by recreational boaters," RBOC President Cleve Hardaker said in a statement. ALEXANDRIA, Va., May 31, 2012 � With Hurricane season officially beginning June 1, forecasters are predicting a "near normal" year of storm activity, which means there�s a good chance that tropical storms will strike the US coastline. However, BoatUS has found a new tactic for preparing for incoming storms � using tie downs with boats stored ashore � that has proven to significantly lessen the impact of storm damage. "We�ve known for a long time that the most effective storm preparation tactic a boat owner can do is to remove the boat from the water and store her ashore in a location above the anticipated storm surge," said BoatUS Director of Damage Avoidance Bob Adriance. "That�s why we created the Hurricane Haul-out Coverage overage included in all our boat insurance policies that helps defray the cost to remove a boat from the water." 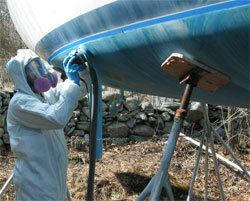 Want to learn more about BoatBuilding.net? Got a news item you would like to submit for publication? Working on a project you would like us to feature? Join today and become a regular contributor. Registration is free! Crossing the Gulf Stream tonight?